The cinema was asked to arrange a screening as the endpoint of a bicycle tour around urban gardening sites in Stockholm. All part of the Urban Gardening Safari-program, organized by artist Malin Lobell and Gröna Linjen. The screening was set to take place on the rooftop of a powerstation embedded into the mountainside of the park Vanadislunden. The rooftop has a large flat area, and warm exhaust from the powerstation is pumped out onto the roof through ventilation shafts. There are already a couple of old appletrees growing on the roof, forgotten and shrunken. The site is not completely overlooked though, as there were evidence of the roof being used by homeless people. The site of the powerstation was formerly used as an outdoor theatre, with the mountainside as backdrop. The screening was impeded by torrential rains and a thunderstorm, and for the first time since we began, one of our outdoor screenings had to move indoors. An audience member lived across the street form the park, and opened his home to the cinema. A short film with Lenin visiting an allotment garden during his trip through Sweden in 1917. The film is based on an unconfirmed story about how Anna Lindhagen brought Lenin to visit Barnangens allotment garden in Stockholm. Lenin is said to have become angry that workers engaged in farming rather than revolutionary work, and saw it as a sign of false class consciousness. Anna Lindhagen, sister of the Social Democratic mayor of Stockholm, was active in introducing allotment cultivation in Sweden. During the First World War, when Sweden was isolated from the import and export of food, the gardens would help the poorer part of the population with their food supply. Hunger Riots and looting of shops were common in Sweden at this time, and may have been the breeding ground for later reforms such as the 8 hour working day. Ingeborg Holm is a play written by Nils Krok from Helsingborg in northwest Scania. Kroks play is based on a real event, a case he was involved in as part of his social work. The play was filmed by Victor Sjöström in 1913. A striving family are working in their allotment when they are told that they have received a loan to start up a grocery shop. But the man dies, and the widow Ingeborg Holm can not feed their children, nor pay off the loan. The children are placed in foster homes, while Ingeborg has to work within the social services. She is then stricken with mental illness. The impact of the film was so great that it incited Swedish lawmakers to rewrite the Poverty Law. Stumpenensemblen is a theater group from Helsingborg, active since the year 2000. The ensemble consists of a mixture of theater professionals and amateurs both on and behind the stage; most of the amateurs come with experiences – their own or from family/friends – of mental illness, substance abuse, homelessness and exclusion. They have annually put up new shows, such as The Threepenny Opera, Ingeborg Holm, and a specially written piece by Henning Mankell, I Thought I Heard Dogs. Kvillebäcken, an area of Hisingen in Gothenburg, was previously characterized by rental housing and small-scale businesses in temporary premises. When the city wished to extend its center with a showcase for sustainable urban development, the houses in Kvillebäcken were bought and the tenants were evicted. Local media and local politicians justified the demolitions with a vilification of the area, which was renamed the “Gaza Strip”. 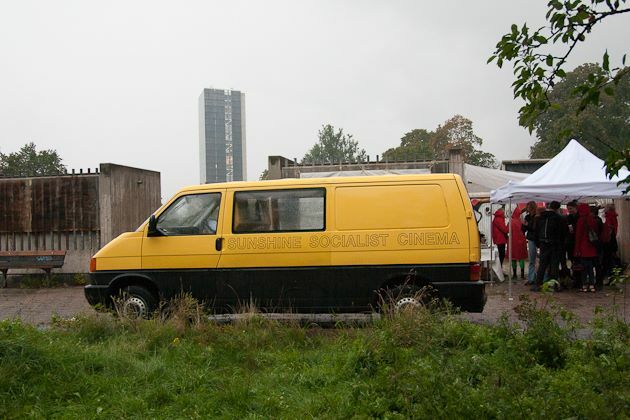 In a film, made as a brief news report for Newsreels From The Gothenburg Commune, urban farmers who have temporarily been working on a demolition site talk about their work and their role in the area. The film was first shown in connection with Göteborg International Biennial for Contemporary Art in 2013. At Komettorget in the Gothenburg suburb Bergsjön a group of farmers have created a green oasis. During four months in 2011, Maria Draghici and Anders T Carlsson have talked with the farmers and documented what the place means to them and others in their vicinity. Gazebos built by farmers in 2009-2010 were photographed and presented as examples of architecture, in the context of the Göteborg International Biennial for Contemporary Art 2011. A Dialogue Table was set up to present and discuss the Komettorget allotments, together with the farmers, some representatives from City Planning and Parks and Landscape Management, and researchers working on urban planning issues. The discussion began with a screening of this film. This entry was posted in Cinema, Films, Places to meet up, Program. Bookmark the permalink.